I want to help you end the year with some warm laughter, and the best vehicle I can find is this wonderful story by my friend Dhaya Lakshminarayanan about teaching mathematics to her mother -- and about the American dream. It appeared on Snap Judgment in August. Verizon: "Your session is now closed. Thank you, have a nice day." Stephen : Chat ID for this session is 12281146501. Stephen: Hello. Thank you for choosing Verizon and visiting our Verizon chat service. How can I help you place your order? You(21:01:30): I am looking at the $104.99 2-year contract. What am I paying now? Stephen(21:02:30): let me send you a link to check your bill. Stephen(21:02:50): Please click on the above link to check your bill after logging into your online account. You(21:03:47): I don't recall my user name or password, and when I clicked on the link to retrieve them, nothing happened. Stephen(21:04:22): Do you have a paper bill whch you can look? You(21:05:35): No, I don't. The site responded, and I asked for both. The next screen is blank, so far. Stay tuned! Stephen(21:06:35): Let me provide you with the number to call and get this infromation, as online being into the sales department, we don't have the internal access to look into your account. Stephen(21:06:50): Please contact our Consumer Solutions Center directly at: (800) VERIZON or (800) 837-4966, 24 hours a day, 7 days a week. You(21:07:27): I called the number before i tried this live chat, and it said no one is on duty at this hour -- even though it claims to be available 24x7. Stephen(21:08:37): I understand. In that case, I recommend that you try back later or come back online during the business hours. So that the online account specialists are available during that time. You(21:09:47): So 24x7 doesn't actually mean 24x7? Stephen(21:10:27): It should be 24 X 7, because most of our customers do get it available 24 X 7. Stephen(21:11:22): Do you have any other questions for me today? You(21:11:35): I guess I am special! As I went through the menu on the phone, it asked whether i wanted to talk about FIOS internet, Phone, or TV. I have all 3. I picked internet and then got that message. Would I do better picking some other choice? Stephen(21:12:05): Let me send you a link to contact Verizon via email about it, and get it resolved within 24 hours. Stephen(21:12:31): Please click on the above link to contact Verizon via email. You(21:12:50): About what, my initial question about the 2-year contract, or how to talk to a representative? You(21:13:38): Meanwhile, the online request for my user id and password stopped functioning. Stephen(21:14:04): I am sorry, but per your first statement, you just asked question about your existing bill. Could you please be more specific on your initial question that you are trying to ask? You(21:14:51): I am trying to compare the offer you have on your website, for a two-year contract, with what I am currently paying. Stephen(21:15:21): Which Verizon services do you currently have? You(21:15:35): FIOS internet, phone, and TV. Stephen(21:16:15): You can go for our Verizon FiOS Triple play with FiOS Prime HD 15/5Mbps Internet FiOS Digital Voice Unlimited calling for $104.99 a month with two years price guarantee. Stephen(21:16:30): If you are out of the contract or under the last 60 days of the contract, then you'll get $300 Visa reward card. You(21:17:21): I understand that offer. What I do not know is what I am currently paying, so I can compare the offer with my current rates. I don't even know if i have a current contract. Stephen(21:17:51): Like I said, you need to login into your online account to see your bill, or check your paper bill. Stephen(21:17:56): Can I assist you with anything else from my end? You(21:19:09): And, I keep telling you that your website which is supposed to help me get online by restoring my user id and password is not working. And your 24x7 phone line is also not working, telling me to call back during business hours. You(21:19:50): Is this some kind of cruel joke? I am interested in the product you are offering, and you are making it impossible for me to evaluate it. Jacob(21:23:03): Hello. Thank you for choosing Verizon and visiting our Verizon chat service. How can I help you place your order? Jacob(21:24:38): I sincerely apologize for all the inconvenience caused to you. How may I assist you today? You(21:26:12): I am interested in the $104.99 two-year contract. I would like to compare it, though, to my current FIOS charge for TV, internet, and telephone service. I do not recall my user name and password, and your website does not function to restore those to me. I tried calling the 24x7 800 number for customer service, but it was not available. Jacob(21:26:32): Let me assist you here. You(21:26:40): My simple question is whether you can tell me what I am currently paying, so i can compare your offer with my current charges. Jacob(21:26:45): Could you please let me know, if you have UserID and Password for Verizon service account? You(21:27:14): Did you see my note above? "I do not recall my user name and password, and your website does not function to restore those to me"
Jacob(21:28:09): I do apologize for that. Let me assist you with the link to check the plans and price for the service. Please click on the above link and enter your Home phone number. You(21:29:10): That site says: "Enter your Verizon home phone number if only adding a bundle or new Internet or TV service. You will not be able to see or modify existing services." Jacob(21:30:10): Yes, you would need to register online for the UserID and Password. Jacob(21:30:21): Could you please let me know, if you do not have Home phone service? You(21:30:32): I have home phone service. Jacob(21:31:02): Great! Please enter the Home Phone number and you would be able to view the service. You(21:32:26): I have done that, but no, I cannot view the service. It asks me to select a plan I might be interested in. It does not show me my existing plan or charges. Jacob(21:33:01): Yes, you would be able to select the Triple bundle at $104.99/month, you would need to select Prime HD TV plan, Internet plan with speeds up to 15/5 Mbps and Unlimited calling plan. Jacob(21:33:11): About the Existing service, you would need UserID and Password. You(21:33:55): I am trying to compare that offer to what I am currently paying. As I explained to you already, I do not know my user id or password. Jacob(21:35:15): Yes, I do understand your concern and as you do not have UserID and Password, it would not be possible to check the existing service. Jacob(21:35:30): You would be able to view the new plans and price listed on the Build Bundle page, that you can opt for. You(21:36:20): Is this some kind of cruel joke? I am interested in the product you are offering, and you are making it impossible for me to evaluate it. Jacob(21:37:50): Let me assist you with the link to retieve your UserID and Password. You(21:38:21): I have already explained to you that that link does not work. You(21:39:27): Perhaps, instead, you could send me the link to RCN or Comcast . . .
Jacob(21:40:32): I sincerely apologize here for the inconvenience caused to you. Jacob(21:40:53): I would recommend you to try the link and let me know, if you are able to retrieve your userID and Password. You(21:41:57): Jacob, I already tried that. I am sure none of this is your fault, but this has been an extremely frustrating interchange. Perhaps we should just call it a night. Jacob(21:43:12): Please try to proceed with this link and check, if you can retrieve your userID and Password. You(21:45:25): The link doesn't even load now. Last time, it loaded and did not work to deliver the Id and password. I think you should move on to help the next customer. Jacob(21:46:50): In this case, I would recommend you to call our Local Verizon Office and get the UserID and Password for Verizon service account. You(21:47:16): What is the number for the local office? Jacob(21:47:51): You may please call The Local Verizon Office at 1-800-837-4966 between 8:00 AM and 6:00 PM EST from Monday to Friday. I assure you the best assistance. "Early-term infants have higher rates of respiratory distress. There are also issues with feeding," says Dr. Lauren Smith, medical director at the state Department of Public Health. "The most recent evidence shows that babies born before 39 weeks may also have developmental issues, so when you add up the increased risks and you weigh that against a situation when it’s purely elective, then you really can’t justify it." What is sad about this story is that while it is considered news among the medical community here in Massachusetts, it is "olds" elsewhere in the country. [I]n 2001 the Intermountain pregnancy, labor, and delivery leadership dyad focused on the induction of early labor as a target for improvement. They created a shared baseline that identified when elective induction is medically appropriate and deployed it across the entire Intermountain system, which performs more than 32,000 deliveries each year. When an expectant mother arrived at the hospital for an elective induction, nurses completed an electronic check sheet that summarized appropriateness criteria. If the patient met the criteria, the induction proceeded; if not, the nurses informed the attending obstetrician that they could not proceed without approval from the chair of the obstetrics department or from a perinatalogist—a specialist in high-risk pregnancies. Elective inductions that did not meet strong indications for clinical appropriateness fell from 28 percent to less than 2 percent of all inductions. The length of time women collectively spent in labor fell by roughly thirty-one days per year. As a result, Intermountain is now able to deliver about 1,500 additional newborns each year without any additional beds or nurses. The new protocol reduced the rates of unplanned surgical delivery (cesarean section) and the attendant higher costs. Intermountain’s overall rate of deliveries by cesarean section is now 21 percent, while the national rate is approaching 34 percent. The protocol also reduced admission rates to our newborn intensive care units, reducing their costs as well. We estimate that the Intermountain elective induction protocol reduces health care costs in Utah by about $50 million per year. If applied nationally, it would lower health care delivery costs by about $3.5 billion annually. What other innovations in the delivery of health care have yet to arrive in Massachusetts? The state's academic medical centers are tops at scientific research but often lag with regard to adopting process improvement and applying the scientific method in care delivery. In so doing, they cause harm to patients and permit waste and extra cost to persist in the state. I hope Martha and her team have a chance to focus on that question. With this view of winterberry in the field behind my house -- on a sunny, warm and decidely not winter-like day in Boston -- I leave you for a blogging break through the New Year. Thanks for your loyal readership, and best wishes for a lovely holiday season for you, you families, and your friends. Let's also give thanks to our colleagues in the health professions, the most well intentioned people in the world, who devote their lives to alleviating human suffering caused by disease. Stay tuned. Lots more to come in 2012! A colleague informs me that 98% of people who are reading a story on the New York Times on-line version do not "turn the page" when the story jumps to a second page. If that is the case, it presents a crystal clear rationale for redesigning the website, taking advantage of the flexibility one has in graphic design to make it more likely that people will read more of the high quality content that The Times offers. Let's do a little crowdsourcing here. How would you design the web version of the newspaper to encourage and enable subscribers to read more of these stories? My simple answer, although I don't know if it is technically possible, is to have the story automatically expand as it senses your cursor reaching the last paragraph on the first page. How like John Halamka to share with the world his and his wife's experience with breast cancer. John believes that knowledge is power, and shared knowledge even more so. Tune in on his blog every Thursday for an update. John McDonough, one of the health care experts in Massachusetts, writes on his blog about the three-year renewal of the state's Medicaid waiver. John presents a history of the waiver and notes that it provides the "green glue," i.e., the infusion of federal cash, that makes possible the health care reform process approved by this state several years ago. The details are impressive. $26.7 billion over three years, a $5.69 billion increase over the prior waiver, and bringing $13.3 billion federal dollars to the state; $120 million for safety net hospitals such as Boston Medical Center (BMC) and Cambridge Health Alliance (CHA); a pilot project to improve pediatric asthma care; a first-in-the-nation express renewal process for MassHealth, the state's Medicaid program; enhanced early intervention services for Autism Spectrum Disorders, and more. There are many similarities between the Massachusetts health care access legislation and the federal plan passed by Congress -- individual mandate, guaranteed issue of insurance, an insurance exchange with minimum coverage standards, and subsidized insurance plans for lower income people. The big difference is that a substantial part of the costs of the state plan are covered by this Medicaid waiver, offsetting appropriations that would otherwise be needed from the state treasury. The federal government, in contrast, has no higher level of government to provide funding for its program. It was well known when the federal bill passed that the financial projections showing zero budget impacts were wrong, ignoring, for example, the annual multi-billion dollar override of the SGR adjustment for physician salaries. Since the legislation really did not provide comprehensive ways to address those cost increases, they will remain a political battle in coming years. I write it as a citizen watching the unfolding of a business plan that seems to me to be building in future health care cost increases for our region, or worse, potentially weakening one of the country’s great hospitals. I underestimated by a factor of two, for now the hospital has filed a notice of intent with the Boston Redevelopment Authority to develop 360,000 square feet of research and wet laboratory space and 355 to 455 parking spots. I am not current with construction costs in the highly congested Longwood area of Boston, but I believe it reasonable to assume at least $1000 per square foot for lab space. Underground parking spots, requiring slurry wall construction in these high water table soil conditions, come in at $80,000 each if not more. So, the total price tag, assuming room for 400 cars, not counting demolition and clearance costs of the existing structure, is about $400 million. This takes your breath away. A billion dollar construction program, in the face of the end of the federal stimulus program for NIH research and likely flat funding going forward. The capital accumulated must therefore derive mainly from margins made on the clinical business. If anything gives the lie to the idea that the recently signed contract with Blue Cross Blue Shield was not overly generous, you have it here. More than nine in 10 baby-changing units in the North West have tested positive for traces of cocaine. The tests, carried out by using specialist wipes, found that 92 per cent of the 100-plus units examined carried traces of the class A substance. They included facilities based in public toilets in shopping centres, hospitals, police stations, courts and churches. I know that talcum powder is not longer recommended for babies, but isn't this going a bit too far? When the health care reform bill was pending, and the Congressional Budget Office was asked to opine on its financial impact, one of the "givens" in the cost equation was the annual sustainable growth rate (SGR) formula included in the 1997 Balanced Budget Act. The was a provision that would reduce physician Medicare rate schedules each year. The SGR adjustment was to save hundreds of millions of dollars during the ten-year analysis period used by the CBO. It was included in the calculation because it was a sure thing prescribed by law. The problem is that, since 2003, Congress has postponed the rate reduction. Each year, thousands of doctors from around the country, directly and through their trade associations, lobby hard -- and they are successful. Postponing the cuts . . . would cost $21 billion for a one-year delay and $38.6 billion for two years. Fully repealing the formula would add nearly $300 billion to the deficit, according to the Congressional Budget Office. Rest assured, the cuts will be postponed again, kicking the can further down the road. After a very long Monday, House Republican leaders announced last night they would not hold an up-or-down vote on the Senate’s two-month payroll tax cut and SGR patch. Instead the House plans to take a series of mostly show votes today, including one on the motion to reject the Senate's version and instruct conferees, and another on a "majority resolution" that restates the House Republicans' priorities when it comes to a two-year "doc fix" and other parts of the year-end package. Little is certain, and GOP leaders were careful not to overpromise on the slate of votes today. Majority Leader Eric Cantor (R-Va.) said the endgame is to appoint a conference committee "so we can actually work the differences out." He added: "We can resolve this situation and the people of this country can get what they deserve — certainty on tax policy and health care policy going forward." Minority Leader Nancy Pelosi said she would not appoint members to a conference. As financial pressures impinge the health care system, the various players sometimes seek legislation to protect their interests. I have heard of two such situations in Massachusetts, and I offer them for your consideration and your comments. The first involves emergency ambulance service. Earlier this year, several of the major insurers in the state stopped reimbursing out-of-network ambulance providers, and instead started to send the checks to patients who used those ambulances. Those ambulance companies now have to try to collect from people for payments, and they are losing hundreds of thousands of dollars. I can understand why the insurers want to use lower cost ambulance services, but I have trouble imagining a more cruel thing than approaching a patient or a patient's family after an emergency situation (which perhaps led to long-lasting disability or death) to collect funds that the insurers have sent to the family. It is also inherently inefficient and adds costs if the ambulance companies have to try collect funds from hundreds of individual patients rather than the few insurance companies. Rep. Jim Cantwell of Marshfield has filed a bill to force insurers to pay EMS providers, and it has a cost-control provision that would give ultimate rate-setting power to local selectmen. The Fire Chiefs Association, Massachusetts Municipal Association and Massachusetts Hospital Association support this bill. This sounds like one that, in legislative parlance, "ought to pass." Then there is a proposal that comes out of the growth of tiered networks, in which insurers charge higher co-pays or otherwise limit coverage to patients who choose higher cost providers. Well, it turns out that some of those high-cost providers are seeking legislation that would require insurers to include them in the low-cost tier of the network. The two fields at play are pediatrics and cancer care. The providers' argument is that they offer essential services not available at other providers, or that they offer similar services but at higher quality. Given the current absence of current and publicly available quality and outcome data, it is hard to make a persuasive argument for this exemption from the tiering system. If I were a legislator, I would want to see the numbers and be assured that the stated services are indeed not available from other lower-cost providers or that they are not the same quality. And, yes, if then persuaded that these are essential and of higher quality and are being allocated away from poorer people because of the pricing regime, legislation might be warranted. But the burden of proof should lie with the providers requesting such an exemption. Also, since things change over time, the process for such exemptions should rest with a regulatory agency rather than having specific providers' names being written into the law. I welcome your thoughts on both of these matters and wonder, also, if people are seeing similar issues arise in their states. For those who think texting while driving is dangerous, let's consider how many people hit regular mailboxes while driving! The USPS is clearly a public safety hazard. Medscape Today has an article featuring "The Most Significant Medical Advances and Events in 2011." The list includes things like some FDA drug warnings; the fact that the Supreme Court will review the health care reform law; some finding about cellular phone use and brain activity; withdrawal of propoxyphene from the market; and new listings of top hospitals. To which I say, "Bah, humbug!" Most of the things mentioned have had and will have little or no impact on you, me, our relatives and friends as we seek to get care or avoid care. 1 -- A patient named Christian who persuaded a nurse to allow him to administer his own dialysis, and who then trained others, transforming care in a Swedish hospital. 2 -- Peter Pronovost and colleagues document that reducing central line infection rates in Michigan also lowered costs. 3 -- Glen Cove hospital achieves 1223 patient days without a central line infection. 4 -- The one million people of Saskatchewan allocate $5 million per year of government funds to establish and maintain a Health Quality Council, an independent agency that measures and reports on quality of care in Saskatchewan, promotes improvement, and engages its partners in building a better health system. 5 -- The University of Michigan Health System demonstrates the power of adopting a Lean process improvement philosophy and generously shares its experience with the world. 6 -- Jeroen Bosch Hospital in the Netherlands celebrates the opening of a new building by enthusiastically endorsing transparency of clinical outcomes. 7 -- Aided by the Vermont Oxford network, thousand of neonatologists create state consortia to to set statewide targets and objectives, compare best practices, and understand the variability in clinical practices across and within institutions. 8 -- The SCAD ladies band together and influence the direction of medical research. 9 -- The Sepsis Alliance presses for greater awareness of this deathly clinical syndrome. From selective breeding to genetic modification, our understanding of biology is now merging with the principles of engineering to bring us synthetic biology. Written, animated and directed by James Hutson, Bridge8. Well worth the six minutes it takes to watch. If you cannot see the video, click here. Eric Lu and his friends from the Jubilee Project are back with this funny skit, supported by students from Harvard Medical School. As always, every time someone views the video, a contribution is made to a worthy cause. Look for a cameo appearance in this one by Dr. Nancy Oriol, HMS Dean for Students. Hmm, seems like there is not much correspondence between corporate missions and how leaders spend their time. The world's second-largest soda company will pay for workers and their dependents — about 250,000 people — to travel to Baltimore for cardiac or complex joint surgeries, such as correcting problems in a previous knee replacement. PepsiCo will also cover the deductible and coinsurance for the procedures. It's a free country, so PepsiCo can do as they like, but I wonder what the basis is for choosing Hopkins instead of another hospital. Is it that it can demonstrate superior outcomes compared to other hospitals around the country? No it cannot, but there are no published figures that would enable that kind of comparison. As this is mainly incremental business for Hopkins, I am willing to bet that the price offered is substantially below that charged to local residents going to the hospital, whether covered by Medicare or private insurers. In a large, fixed-cost institution like Hopkins, as long as you don't have to add new physical facilities and expensive equipment, you can price just high enough to cover your short-term marginal costs and come out ahead. I wondered if things might be different in Canada. We don't really have Academic Medical Centers in the same manner as the US system. But I picked some of our largest teaching hospitals or networks that partner with Canada's largest medical schools. I also made a second wordle using all the mission statements of our Saskatchewan health regions for a comparison. Continuing our theme of visual compilations of mission statements from hospitals. 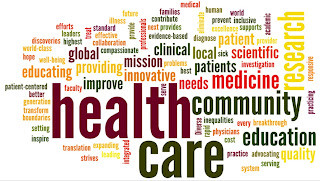 Joe Colucci, Research Associate at the Health Policy Program of the New America Foundation, compiled a wordle from the mission statements of about 50 nonprofit hospital systems across the country. He notes that if you zoom in on the image, there's quite a lot of detail -- small words that only recur a few times. Responding to my post below, a Facebook friend, Emeline Aviki created -- faster than you can say "AMC"! 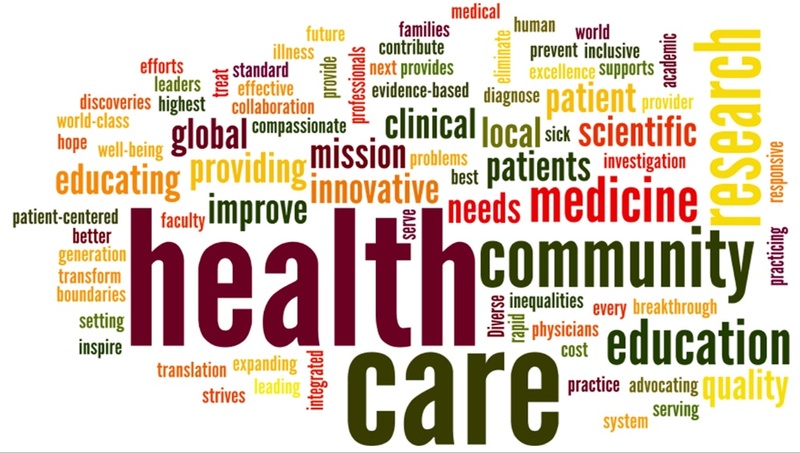 -- this wordle based on the missions statements from seven leading US academic medical centers. She notes: "The most concerning words that are missing from this image are 'sustainability' and 'efficiency.'" Many are learning the words and including them in their mission statements: patient-centered, world class, team-based care, value, quality improvement, etc. etc. But unfortunately, other than individuals leading extraordinary efforts (like Peter Pronovost and others), the academic medical center leadership and overall organizational design continues to persist in an increasingly outdated mindset, and in an organizational hierarchy with vertical department silos that actually prevents implementation of the improvements described by the words in their mission statements. What would this look like for academic medical centers? "An analysis of the mission statements of leading US art museums yields some surprising results," By András Szántó. From Art Basel Miami Beach daily edition; Published online: 01 December 2011. 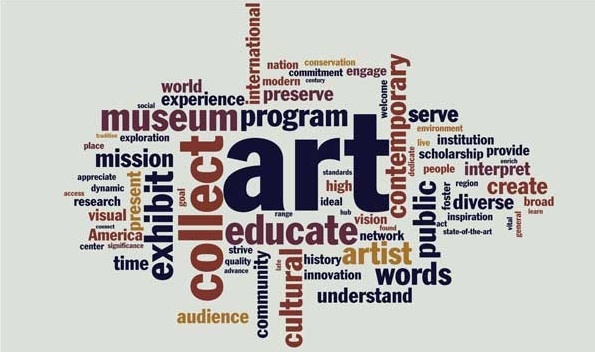 The graphic above shows most frequently used words in 60 museum mission statements. The bigger the word, the more often it appears. Quick. What do the following terms have in common? Beauty. Values. Discussion. Contemplation. The answer: none of them figures prominently among the institutional imperatives of US art museums—at least in light of their mission statements. 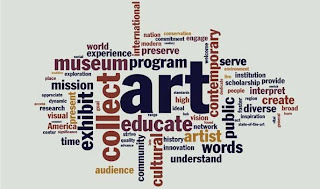 In fact, if you scanned 60 mission statements of prominent museums that exhibit contemporary art, you would find that each of the words above appears exactly once. Other words found missing from 59 of 60 mission statements: advocate, progressive, ambitious, ethical, intelligence, strategic, video. If we were do the same for the nation's academic medical centers, what words would predominate? Which would be missing? Please provide your answers in the comments below. #IHI You may recall my post below about staff recruitment, orientation, and engagement programs at the Gaylord Palms in Kissimmee, Florida. 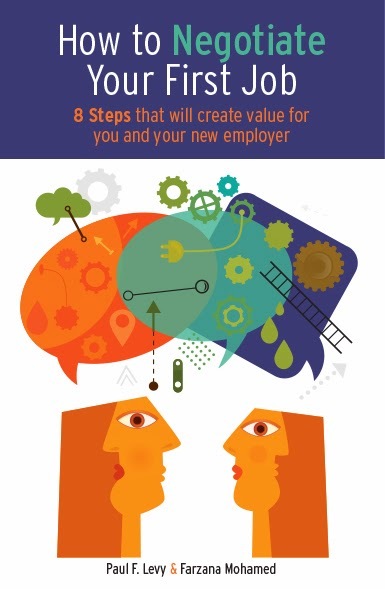 Here's another I liked a lot, which could be easily replicated by any employer. The goal is to promote employee health and wellness, but not in a heavy-handed way. Consistent with the leadership philosophy of the Gaylord Palms, they made it fun. The prize is $1,000. 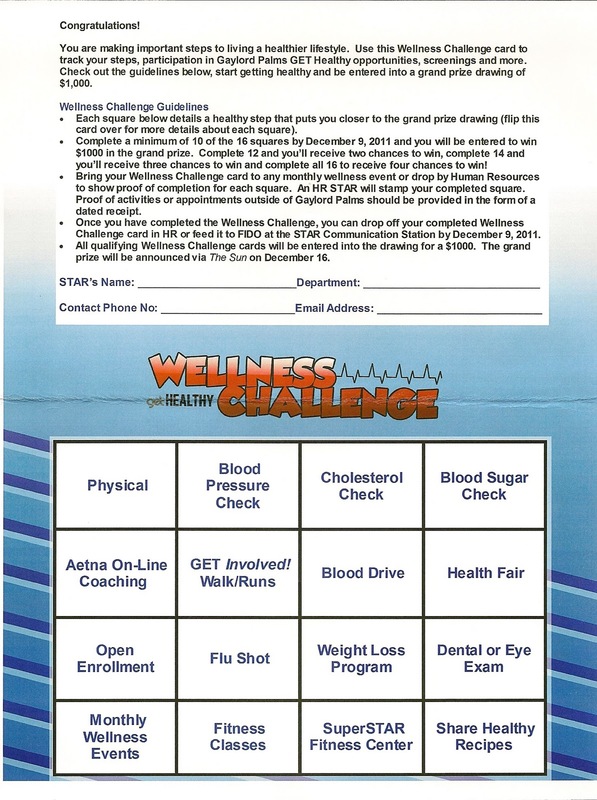 You take your "bingo card" (above) and have each box in the bottom half certified when you carry out the measure, e.g., physical exam, blood drive, flue shot, etc. If you complete 10 of the 16 squares, you are entered to win in the drawing for the grand prize. 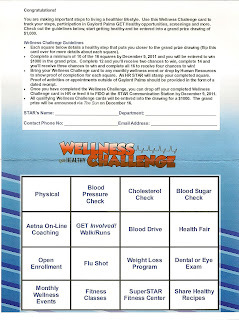 If you complete 12, you get two chances to win; 14, three; and 16, four. I think this is a painless and enjoyable way to promote employee health. I am also willing to bet that participation in the program reduces the company's health care bill by well more than the cost of this incentive program. 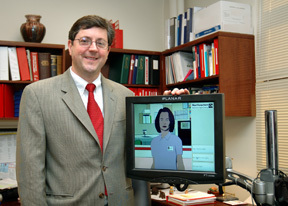 [Brian] Jack and his colleague Timothy Bickmore of Northeastern University have enlisted “Louise,” an avatar, or virtual discharge advocate. She appears on a computer-like screen that is rolled up to patients’ hospital beds to walk them through the discharge process. Oh, come on. Let's take some of the energy that went into this kind of programming and direct it to adopting Lean process improvement so that real, live nurses or case managers have the time and energy to carry out these functions. Meanwhile, recall this scene from I, Robot. Sonny (a robot): What does this action signify? I want to add a couple of more items to the post below about John Billi's MIT-sponsored webinar about Lean at the University of Michigan Health System. This is all good stuff, but it is not a full-fledged implementation of an organizational philosophy. What UMHS found out is that the cultural change inherent in Lean takes a long time to become embedded in the firm. At BIDMC, we used to talk about "tortoise not hare" when we described that. In essence, the process of adopting Lean becomes a Lean process itself. It is one of modesty and constant learning. Look, for example, at what John presented for the coming agenda for his institution. The other point John made is when a map is constructed to enable all to all aspects of the value stream, "it's not the map that's valuable. It the process of mapping, which produces a shared understanding of the value stream and which enables the front-line team to design improvement experiments together." 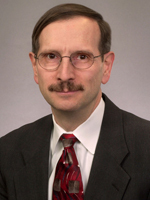 I just listened to an extraordinarily well done webinar from MIT, presented by Dr. John E. Billi, associate dean for clinical affairs at the University of Michigan Medical School and associate vice president for medical affairs at the University of Michigan. John leads the Michigan Quality System, the University of Michigan Health System’s business strategy to transform clinical, academic, and administrative functions through development and deployment of a uniform quality improvement philosophy. As noted in the webinar summary, the University of Michigan Health System (UMHS) has been on the lean journey for the past six years, creating the Michigan Quality System. UMHS has 20,000 faculty, staff, and trainees. The goal is to create 20,000 problem solvers who are finding and fixing root causes of problems they face daily. Dr. Billi described UMHS’ initial approach, results of early experiments, what leaders learned, and how they adjusted. The discussion covered the transition from scattered projects led by coaches to an integrated approach that incorporates people development and process improvement. But even better than the substantive results was the fact the Lean approach resulted in pull-based authority. Having achieved a broad consensus on objectives and experiments, the front-line team was able to exercise their discretion in how to carry out the improvement. You see them here accompanied by the grandson of a patient, another key participant. John summarized other key lessons. The first is about how authority must devolve to make Lean work. "Leaders have to show respect, which means trusting people to solve their own problems if they are given the tools." Finally, to reach the goal of having 20,000 problem solvers, you need to design brilliant processes, based on creating standard work. I have some more observations in the post above. When Erin Tally took Aidan, her 2-year-old son, home from Children’s Hospital Boston on the day after his urinary surgery, she brought along a new friend: a 4-foot-6, 17-pound, two-wheeled robot that would help deliver care to her recovering child. Over about two weeks that included five video consultations, the robot, made by Vgo Communications Inc., of Nashua, eliminated the need for Tally to drive Aidan into Boston every three days for post-surgical checkups. 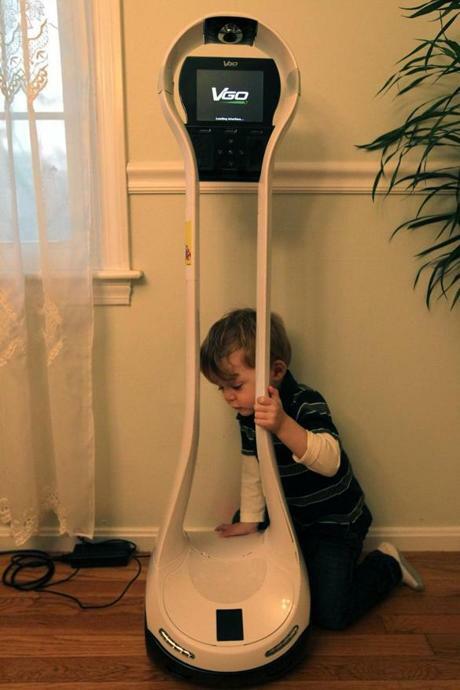 With cameras, advanced audio gear, and a video screen on its “face,’’ the robot allowed Aidan and his parents to talk with nurses and doctors in Boston. They could see and communicate with Aidan and his parents, take close-up photos of his surgical scars for doctors to review, and help determine what type of medications he needed. Let's acknowledge that it would be inconvenient for a parent to drive the child in for follow-up appointments and could be a discomfort to the child. Is there another, less-expensive way to use technology to "see and communicate with Aidan and his parents, take close-up photos of his surgical scars for doctors to review, and help determine what type of medications he needed?" I think so. The devices that could be used include a telephone, email or secure patient site, Skype or FaceTime, a camera, and/or an iPhone or other like device. Why spend $6,000 on a robot and more money for 4G service when the elements of a solution already exist? And please don't tell me that the answer is HIPAA. Uh oh, have I now annoyed the robot??? Dave Bowman[feigning ingorance]: Where the hell did you get that idea, HAL? Dave Bowman: All right, HAL. I'll go in through the emergency airlock. This looks like a really good webinar today. Here's the link to register. I am now in medical school, where I am doing an M.D./Ph.D. in Health Care Organization, Outcomes, and Policy. From there, I’ll be a physician/business strategist/health policist–my dream job! And my career goals are (1) to be an amazing physician and (2) to fix the health system, probably in that order. It's nice to see someone with ambition! Let's give him lots of feedback as he opines on the issues of the day. Here's a recent post on leadership.